One of the most common fallacies in climate is the notion that, because the climate was hotter than now in the Eocene or Cretaceous or Devonian periods, we should have no concern for current global warming. Often this is combined with an implication that mainstream scientists are somehow unaware of these warmer periods (despite many of us having written multiple papers on previous warm climates). This is fallacious on multiple grounds, not least because everyone (including IPCC) has been discussing these periods for ages. Additionally, we know that sea levels during those peak warm periods were some 80 meters higher than today, and that impacts of the current global warming are going to be felt by societies and existing ecosystems that are adapted for Holocene climates – not climates 100 million years ago. (versions courtesy of the wayback machine), but the essential points have remained the same. The ‘temperature’ record is a hand-drawn schematic derived from the work of Chris Scotese, and the CO2 graph is from a model that uses tectonic and chemical weathering histories to estimate CO2 levels (Berner 1994; Berner and Kothavala, 2001). In neither case is there an abundance of measured data. While more realistic graphs of temperature and CO2 histories will not prevent the basic fallacy we started discussing from being propagated, I think people should be encouraged to use actual data to make their points so that at least rebuttals of any logical fallacies wouldn’t have to waste time arguing about the underlying data. Plus it is so much better to have figures that don’t need a week to decipher (see some more principles at Betterfigures.org). But these collations are imperfect in many ways. On the last figure the time axis is a rather confusing mix of linear segments and logarithmic scaling, there is no calibration during overlap periods, and the scaling and baselining of the individual, differently sourced data is a little ad hoc. Wikipedia has figures for other time periods that have not been updated in years and treatment of uncertainties is haphazard (many originally from GlobalWarmingArt). Each part requires work which could be spread widely across the participants. I have made a start on collating links to suitable data sets, and this can both be expanded upon and consolidated. Combining this data is certainly a challenge, and there are multiple approaches that could be used that range from the very simple to the very complex. More subtly the uncertainties need to be properly combined also. Issues range from temporal and spatial coverage, time-dependent corrections in d18O for long term geologic processes or ice volume corrections, dating uncertainty etc. Finally, rendering the graphics calls for additional skills – not least so that the different sources of data are clear, that the views over different timescales are coherent, and that the graphics are in the Wiki-standard SVG format (this site can be used for conversion from pdf or postscript). This post was inspired by a twitter conversation for Sou from Bundunga and some of the initial data links came via Robert Rohde (of Global Warming Art and now Berkeley Earth) and Dana Royer. This is probably the most in-depth effort related to the issue. Related to that, the International Surface Temperature Initiative (ISTI) is looking for people to visualize our open dataset with global instrumental temperature data. We have nothing to worry about at all. Our current tempts aren’t even at the “climate optimum” or Roman warm period. Thus if we have seen similar temps mow, many many times before…. I’ve been craving something like this myself. I think what most of the highly time-compressed graphs of temperature reconstructions fail to communicate (by design, in many cases!) is the *rate* of temperature change. Sure Earth has been 3, 4, 5, 7+ degrees C warmer in the past, but what’s concerning about even a 3 degree temperature increase is the rate of that increase. So my idea: In addition to more accurate data, could a graph be generated plotting the average rate of temp change, say in degrees C/century, over geologic timescales? You could extend the present-day end of the graph with various model projections. Even a low end estimate of the rate of increase under BAU over the next 100 years would be pretty dramatic compared to the stately shifts of the past. It’s a fabulous notion, Gavin — the very thing, I think, at which crowd-sourcing can excel. i’ve been attempting the 125k NGRIP/Antarctic (Epica beginning) combo. heavy assumptions regarding the bi-polar seesaw mechanism is necessary to get those aligned well. aligning is pretty easy if one allows ~7000 years of mismacthes, but is this ok, probably not… though there are be reasons why antarctic and Greenland cores might lack layers (no snow (deepest glacial arid climate), all surface melt (Eemian, rapid D-Ö events)) haven’t seen the original full NGRIP record though (used the 50yr), but in the deep Antarctic cores the compression issue is notable. as on the series on ice age dating in scienceofdoom-blog (http://scienceofdoom.com/2014/03/03/ghosts-of-climates-past-eighteen-probably-nonlinearity-of-unknown-origin/) is stated the lack of accurate timing in the deeper cores is a major hurdle. f.e. is EPICA 750, 800 or 900Ky is not at all clear to me, what with orbital tuning. As I understand it Abe-Ouchi has proposed a promising alternative to traditional dating, whether the mechanism is correct doesn’t matter wrt timing. Suggesting though the el’gygytgyn core to be included (at least to 800ky) and compared to all others to, if it’s been processed already. This comes from a non-scientist who may be representative of the lowest common denominator. I hope these comments can help science communicate with folks like me. 1. If the graph is to be used for general consumption it should be a simple line graph. The majority of the population is incapable of readily understanding any other form of graphic representation. 2. 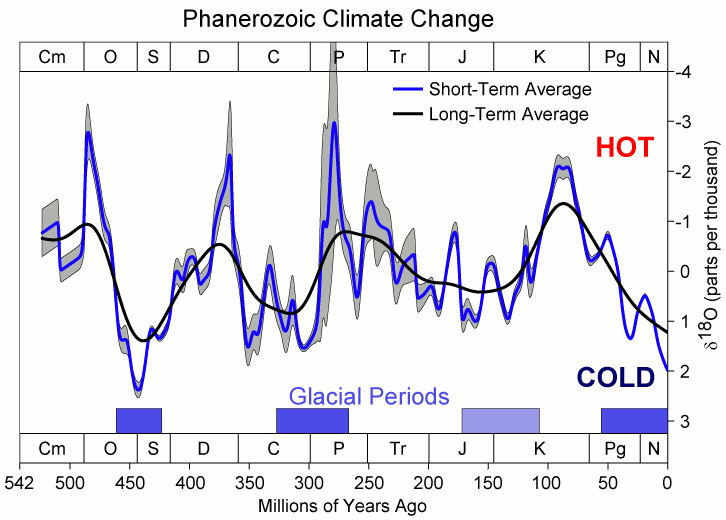 Wikipedia says that the climate that has existed during the last 10,000 years while civilization has developed is, because earth still has some major ice sheets, a glacial-type climate … that it is nothing like the interglacial climates that have occurred during the Phanerozoic era. I submit that it serves no point — and even distorts the message of the graph — to include information about interglacial climates on the graph. 3. The title of the graph is very important. Avoid scientific jargon. Suggestion: “Graph of the Earth’s Climate Since Animals Became Abundant (excluding the human-unfriendly, hot, steamy times)”. 4. The graph should show time on the horizontal axis and important volumes on the vertical. Again, keep it simple. 5. The modern era needs to be contrasted with the entirety of the Phanerozoic. Even though it’s inelegant, consider scaling the first half of the horizontal axis to show the Phanerozoic up to 10,000 years ago, and the second half to show the modern era. 6. The vertical axis should represent the quantities of only the most important factors for humans. Each could have its own separate colored line. Suggested entries: temperature, sea level, CO2, ocean acidity, extinctions, ice volume. These items can be footnoted to show the unimpeachable sources of the data. 7. If possible, have the lines show what the quantities were during the Permian and K-T extinctions. 9. Thanks for the opportunity to add one’s two cents worth. The source is at http://goo.gl/N4WjQf for anyone who want’s to build on it. There is an excellent new book about graphical design for the public. Booklet can be downloaded at no cost. “Visualizing Oceans of Date: Educational Interface Design”, Education Development Center, Inc, Scripps Institution of Oceanography, It discusses three key theoretical underpinnings and gives specific cross-cutting guidelines for presenting data for non-experts (i.e. the general public). Critical are the schemata of experts vs. non-experts. Another issue is that when people look at what appears to be a noisy modern-day temperature series they fail to grasp that all the wiggles and ups-and-downs in temperature can be understood in terms of known forcing factors, both natural and anthropogenic. In other words, the noise that they see is not really noise. I get the impression that the scientists in the know understand that ENSO, volcanic eruptions, wind, tidal effects, LOD, each contribute some factor to the fluctuations, but this point is not coming across. So make that point and show that you understand the details, and you have won the battle. The skeptics feed off of uncertainty and doubt, and this would eliminate a chunk of their argument. One problem that fosters this fallacy is probably that there is a wide perception (which is supported by the communication/argumentation of environmental organizations) that the aim of climate change mitigation is to protect climate against human influence, and thus puts the topic in a “green” edge and produces instinctive defensive reactions of the political opponents. But in fact we are not changing climate in a way that it will be “harmed”, since climate itself will cope with anything we do to it and nature will largely adapt, as both have done in the past. The “real” problem is (even if environmentalists do not like that statement) that on the contrary with mitigation we have to protect us against climate change, since a change to some climate states we have seen in the past would be very difficult to cope with for humanity (80m sea level rise e.g. as mentioned by Gavin). Maybe we should rather speak of “impact mitigation” than “climate change mitigation”. Coming back to the graph: I’d recommend to include in such a graph kind of a compartment where some of the most important impacts (SLR, extremes, vegetation shifts, etc.) of the temperatures at different times (or time periods) are highlighted. This could maybe support some thinking about the harmlessness of climates that have been seen in the past. Appreciating that the following thought may be off-thread, I wish there were a means of using graphic art to depict the original mystery of the Pleistocene, for those who either never confronted the curiosity, or were born after its resolution. Some way of conveying, at a view, how compelling Milankovitch cycles paced ice advances and retreats, but how physically underwhelming their “nudges” were, in comparison to the planetary response. First, you have to be their preacher. Then they will believe the last thing you said, no matter how self-contradictory, and they don’t remember anything before that. You have assumed that most people are actually smarter than chimpanzees. Baaad assumption. Humans have a language module that chimps don’t. Beyond that, you are on thin ice. First, for communicating with a general audience, make the graph extremely simple. Then make it simpler. Once you have made it as simple as you possibly can, make it simpler. All the graphics shown here are FAR too complicated even for an educated and interested general audience. Second, if you are trying to communicate with an American audience, PLEASE FOR THE LOVE OF GOD use degrees Fahrenheit instead of degrees Celsius. Yes, I know that Celsius is the True Language Of Science. But Americans are conditioned to viscerally “get” degrees Fahrenheit. When you express temperatures — and especially temperature increases — in degrees Celsius, Americans don’t really “get it”. If you think it is vitally important to train Americans to use and “feel” of temperatures in terms of Celsius, have at it. But that’s a separate effort from effectively communicating the reality of global warming. This area has always interested me. I have a bit of a paleoclimate background and it’s weird how the field is so often used as an argument against global warming, when we have so many records showing how extreme climate change can be. I think I saw monkton pull out one of those graphs a few years ago, and completely misrepresent it then. For me, the big issue with these longer records is that they are always smoothed out. As humans we care about the decade and centennial scale changes which don’t really show up well. It’s really the abrupt events like the PETM and the end Permian mass extinction that we care about, and they only look like blips on the longer records. The earth tends to heal itself pretty quickly (but not quickly enough for us) after these events so they don’t really register. Take the PETM at 55 million years ago. It’s represented as a little bump on the schematics, so it only looks like a degree or so warming, of little significance, whereas it’s a pretty big event on human timescales. For me, any attempt to show temperatures over these timescales should try and represent these rapid events somehow. Because they’re the most analogous and relevant to what we’re likely to see in the future (though of course they’re not perfect). The wikipedia attempt is a decent go, but yeah, it’s not the clearest figure. For science communications purposes my favourite figure from paleoclimate is the classic antarctic ice core CO2 record because you can show the big old swings in CO2 between ice ages, draw attention to the significant changes seen over those cycles, then pop on the human contribution at the end to see how big a difference we have made. Then you can talk about how big an impact that could have on the earth. It’s a good way of providing perspective. It’d be nice if we could do similar things with temperature. A couple of other points RE: datasets. 1) Elderfield et al 2012 in Science, have produced a deep sea temperature record covering the last 1.5 million years,. This is better than the pure oxygen isotope record form the oceans because it is independent of changes in ice volume. Although it is just one record from one place, it is in theory a pure temperature signal, and deep ocean temperatures are not too variable spatially. 2) A standard problem with geological records is that they are sparser going back in time, and it is always important to bear this in mind, given that global surface temperatures are pretty variable. So this is probably an issue patching together the data, e.g. ice core records vs deep ocean temperature. For records where there is overlap there could be some sort of bootstrapping done. Agree with the concept of SIMPLE. The author NEEDS to become familiar with Tufte’s book on how to make understandable graphs. So color me slow, dense, and generally clueless, but if the points you want to make are about time, heat, sea level rise, and the zone in which civilization thrives best (the agricultural sweet spot or whatever), shouldn’t your graph include and focus on those elements? Straight up so that Joe Bloke doesn’t have to spend his day mapping out the implications of Phd level data p o r n? Gavin: You mention one fallacy people propagate when talking about that graph. However, I think that a similarly common fallacy is to make the claim that the graph shows there is no particular correlation between temperature and CO2 levels. (2) Over long enough time scales that there can be significant shifts in continent locations, solar insolation, …, we would not expect temperatures to correlate so closely with CO2 when there are these other equally important variables that have significantly changed. The wikipedia graphic is probably not too far off the mark as far as I understand the existing data sources. There are huge uncertainties over temperature and CO2 levels in the more distant geological past (pre-Cenozoic) and any graphic would have to reflect that. However, The representation of the Holocene in relation to previous Late Pleistocene interglacials in the black line looks poor – temperatures for the Holocene are fairly typical for a Late Pleistocene interglacial (prior to AGW) and the natural (non-anthropogenic influenced) shape of the interglacial would probably resemble stage 11 at around 400 kyr – though this is somewhat disputed on astronomical grounds. Marine calcite O18 records convolve temperature and ice volume, though there is an attempt to separate these components in Elderfield et al., Science 2012 for the last 1.4 Ma. Nb the temperatures given there are for the southern ocean, not global, just as the Antarctic record is Antarctic not global, though obviously closely connected with global climate. Lear et al., Science 287 (5451): 269-272 show how Mg/Ca can be used to calibrate oceanic temperature over about 50Ma, adjusting the Zachos 2001 isotope composite which is widely used for this interval. Any one record is bound to be a record of a particular place and not necessarily fully representative. A truly long term picture of global climate would be a great thing to have … maybe the best approximation for these purposes would be to plot everything, including the Holocene, on one time scale, then have a “magnifying glass” graphic zoom applied to the Holocene itself to show its currently understood shape so far. Two quick points, first on “It has been warm before”, Richard Alley explains how it has been to hot to exist in the tropics (28 mins into the video) – and around the areas where we grow most of our crops today. Second it would be really great to have all these graphs released under CC-BY-SA, so we can use them on Wikipedia too (This kind of graph as well). 1. Whoever eventually designs the graphs should re-read Edward R. Tufte’s classic works on this: Visual Explanations, Envisioning Information, and The Visual Display of Quantitative Information. These are truly magnificent works that teem with ideas for making information easier to grasp. 2. I disagree with the suggestions that the graph should be made as simple as possible. I think it is possible to make a powerfully expressive graph that is not at all simple. Again, consulting Tufte will surely help in this. Moreover, I think that THREE variables should be expressed: temperature, CO2 concentration, and sea level. This third one will counter the people who assert that the earth has been really hot before, so we have no need to worry. 3. In agreement with the “simplicity school”, I think that error bars should be left out. Perhaps a graded shading would be adequate. In other words, don’t draw a line, draw a path that is darkest in the center and fades out to gray in proportion to the standard deviation. 4. If you do present all three variables, then you should use different colors to represent the variables: red for temperature, gray/black or brown for CO2, and blue for sea level. I’ll start reviewing Tufte and get back if it inspires any new thoughts. Obviously an app is not a graph, so this may not solve the problem at hand, but it’s a very useful and interesting resource nevertheless. I’d suggest strongly that the ocean’s temperature is the reliable indicator of the thermal balance of the planet, the atmosphere is subject to many more variables and geologists never use it for time-spans less than 30-years because of that. So to get the point across to non-geologists that don’t freak out about 400-ppm CO2 being Pliocene Epoch, instead feature ocean temperatures and relate everything back to that because the ocean is the thermal-mass that provides global stability thermally, not the air. I’d strongly suggest featuring ocean temperature as the basis of climate change, it’s the thermal-mass that has dominance in thermal balance not the atmosphere, geologists never use global air temperatures for time-spans less than 30-years due to variability. So, by graphing ocean temperatures and tying everything else to that, climate change won’t seem so variable as graphing the atmosphere thus far less misleading to people that don’t know what the mean average means or why being cold this winter doesn’t affect the ocean that’s heating up. This is a great idea, but it would be a good idea to think hard about simple, but modern computer graphics, rather than 2D static plots, although a good instance of the former should offer easy extraction of good examples of the latter. A current smartphone has more CPU and graphics power than $100K graphics workstations of the early 1990s, so surely we can do better, even in 2D, much less 3D. 1) I’m very fond of NOAA’s CO2 history, for the nice job it does on timescales. I’d probably like it better if there were a slider bar to control the time window, not just a predetermined animation. 2) I liked Nick Stokes’ presentation of spaghetti graphs, that allows mouseovers to highlight selected lines. 3) We really, really need to do better with uncertainty. I liked AR4 WG I Fig 6.190(c), which in some ways is far more representative of reality than spaghetti graphs. There may be better ways, especially for static graphs. Solomon Hsiang has been doing interesting experiments, as here, or here. He was a recent AGU award winner. Getting him involved would be great. For general communication, I really dislike lines with the usual error bars (as they over-emphasize the edges) almost as much as lines with no indication of uncertainty. Sometimes I wish for 2 sliders: one for timespan, and one for uncertainty, if I had to have bars or gray zones. Again, if one *starts* with a simple interactive display, with some adjustable parameters and controls, then one can experiment and extract good 2D graphs, and see how they work. It is really hard to create great static graphs that are both accurate and compelling to multiple audiences … but I’d guess that most people will examine such graphs via computer, and even printed images can link to the interactive display from where they came. I wonder if it’s “better graphs” that we need, or better narrative “context” for the information people see in existing graphs. Maybe a bit of both. Please make two graphs, with Celsius and the imperial US F*. as these can be seen as the beginning of the modern fauna and flora, the continental distribution that allowed the initiation of the Antarctic glaciations is connected to the former. At least I’ve no interest to destroy all mammals and most flowering plants to get to the Cretaceous again. Graphs and charts are an important tool in demonstrating time scale to events. Visual impacts are more easily and quickly understood than lengthy dissertations. industrial revolution onto today’s warming world. The idea being to show the depth of understanding throughout history, while emphasizing today’s current temperature analysis. When I was younger I lived in Tasmania where treeferns still exist —vestiges of the Upper Carboniferous. I recall walking among the ferns and thinking what it was like when the land creatures were mostly just arachnids and amphibians and trees were giants. This makes me think, why are the CO2 and O2 levels of before, and directly after the Carboniferous Rainforest Collapse being used as an argument for why 400 ppm and rising, CO2 is OK today? (mostly by posters to mainstream news articles) If anything the opposite seems true. 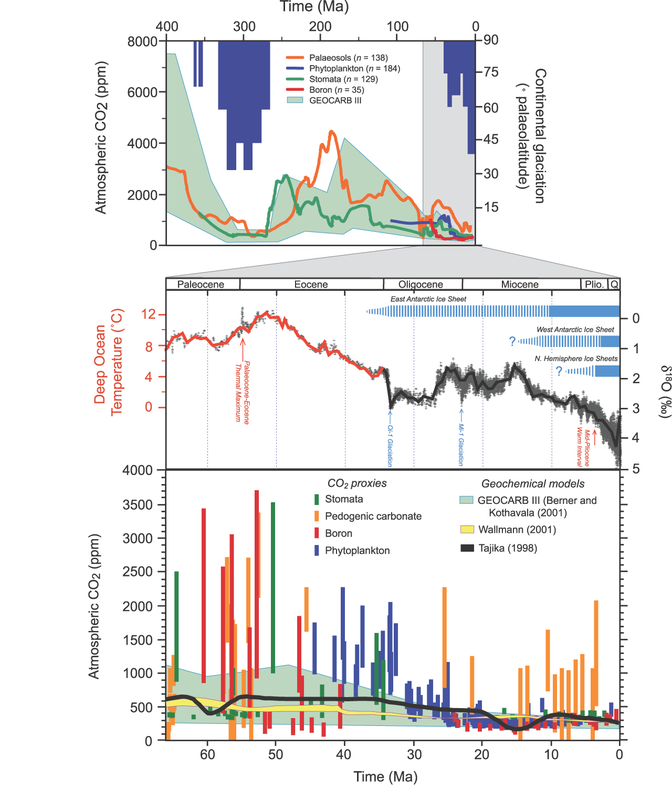 Seem to me, as a novice, that the time scale of adding CO2, like with the evolution of fungus in the Carboniferous, allows for migration or evolution. I also do not see a lot of talk about where land masses were during —in size and/or latitude— various events. Also how can we understand paleoclimate —especially the Cretaceous–Paleogene boundary— unless we can fully understand ocean currents now and then. If we take 150years as the period of reliable direct temperature records ( 1850-ish) then this should be the first timescale chosen. After that scale at orders of magnitude ( 1500, 15k, 150k,1.5m etc.) showing the previous scale as a different colour at the end. This would avoid any issues with cherry picking. #10 WebHubTelescope :”… and you have won the battle”. Can´t they understand that both agents can act simultaneously? And that the result of adding the effects due to ever, man produced increase of CO2 to natural OSCILLATIONS can´t be different than what we are seeing? Is not clearly showing that, though there are natural oscillations, they are going upwards? And something similar can be seen relative to other global warming consequencies. Let us consider the sheer issue of the so called current warming hiatus. Despite all oscillations, is not QUITE CLEAR that after each that could trigger skeptics, temperatures carried on rising? And that IS due to underlying, continuous GHG warming! So far, nobody has given any other sound, possible reason”. I have a worry that some of the ambition behind this project may be asking too much for a single graphical representation. If you stick with a comparison of present global temperature records with various palaeoclimate temperature reconstructions, graphically it would be down to a reasonably simple decision about how to present a few decades of data on a graph that also presented data spanning tens or hundreds of millions of years. A log scale would be the first choice for a scientist but there are drawbacks. It would flatten trends on the expanded bit, be difficult to scale time & greatly confuse those not comfortable with log scales. A single graph should still work with uncertainty data being included as long as there is not much overlapping (ie multiple data sets covering the same time period), but a single graph is now be on the verge of becoming too ‘busy’. So I would certainly warn that superimposing CO2 data onto the same graph (or graphs) would start to make things a lot more difficult, although not immediately insurmountable. Your effort to clarify the rise and fall of interglacial sea levels might be aided by explaining climate dependentt shifts he amount of water residing on land, for example in evaporite basins, dty lakebed and other aquifers and cycles of hydration in rock and mineral weathering . We want to display data over a very long period of time, but we know progressively more about more recent times, and are much more interested in those. How best to do that? One can do multiple pull-outs at larger and larger scales (a la Hansen), but that always looks awkward to me. The alternative is to use some sort of periodic scale change, which is what I attempted. Perhaps it would be better if the changes were more regular and more obvious. Dr Rohde’s graphical skills are considerable, and need to be roped here. Interesting challenge. Existing data has different time spans and resolution. There is monthly data from the present, but not back millions of years. There is overlap asking to weight the data. A graph has to fit the publisher’s needs and the audience’s demand, small ones for mobiles, huge for print, appropriate colors for color blind, Fahrenheit for the American, logarithmic scale and error bars for the literate, last 150 years to document industrialization, last 10,000 for civilization. Targeting the one and only chart appears unfeasible and is actually not needed. An interface on top of the data, letting everyone select or produce a chart might please and attract more users. A data structure to start with would cover a value, a dimension, the time span and attribution per data point. And then a method/program would solve the overlaps, probably the most difficult part, producing charts from the result the fun part. It could be started with a simple Google spreadsheet. However, someone should select editors, and curate data sets otherwise editing wars will follow. It’s a serious community effort, but the most trustable temperature record would change a lot. The more people recognize it the less time is spent discussing cherry picked ones. Anderson, D. M., Mauk, E. M., Wahl, E. R., Morrill, C., Wagner, A. J., Easterling, D., & Rutishauser, T. (2013). Global warming in an independent record of the past 130 years. Geophysical Research Letters, 40(1), 189-193. It’s a good proxy-data fill-in to use in place of the more recent parts of the Marcott dataset, as Anderson has many more proxies and is resolved finer in time. It does require some processing to create a global record from his data, but I’ve already done so and can provide it if anyone is interested. On wood for trees I make graphs that have different colors for ENSO neutral, La Nina, and El Nina. I go by the classifications here. You could also use underlying color bands. Jaffre et al do not apply a pH correction, but at the resolution of their graph, I doubt that is important. Speaking of temperature history… what’s the chance you could put together a graph or analysis of Arctic (or north of 60) warming? I’ve downloaded the binary file for zonal data from GISS for 1880-2012, and will try to do my own analysis, but I bet you could do a better job. I realize that you don’t have spare time to do random analysis, but… maybe this is something you’d be interested in as well. Maybe overlaying multiple scales of temp, CO2, sea level rise, extinctions and numbers of repetitions of the same denying delayalist post about it was warmer back in the good old days would make it clearer. And you could put in some wavy time travel sound effects. I’m very interested in seeing this happen. I’d really like to see a way of presenting the data such that you could tease out how the periodic stuff and the odd extreme event contribute to the global values. I love the way some of the above have timelines of “events” – eg: Pinatubo, Krakatoa. Photon (#4) – I agree with you on rates-of-change…maybe that should be made understandable rather than absolute values – or perhaps a parallel plot. As a reasonably math literate layperson, I find myself explaining that “nothing is decreasing, just the rate of change has decreased”; using more specific language (derivatives, gradients, etc) just results in more glazed eyes. to keep datasets manageable for amateurs like me, I’d suggest about 4000 datapoints as a maximum for each set. for the set having the longest sensible span (420Mya, when life went terrestrial) this would mean 1 data point per 100000years and the Pleistocene would seem near linear. FWIW, I think an animation with the “expanding x-axis”, as seen in NOAA’s CO2 history (see John Mashey #25) is the way to go. You can make the axis linear, but expand it at an exponential rate. If we’re going into deep time (as I think we should) then I would suggest two y-axes: one for temperature, and one for *forcing* (rather than CO2 ppm) which better reflects contributions of both CO2 and solar. You should go back to the Silurian at a minimum as that is the star of land based life forms. Might also be interesting to see a comparison of bio diversity and extinction events. This is a great idea and a group of us (http://descentintotheicehouse.org.uk/) are in the process of putting something together for CO2 using the latest published data. We will hopefully be able to post something soon. FYI, I would be willing to do the graphing as it is what I do (engineer). My biggest problem in doing this (which I have tried before) is a) finding available data sets and not just graphs and b) having someone evaluate the validity of the data sets (climatology isn’t my field of expertise). Sorry for typos in previous post, trying to do too many things at once. I may have missed it, but is there a reason why the PAGES2K data is not used for the 2000 year global temperature reference?